As with many particle size reduction projects, unknown challenges can come up unexpectedly. Jet milling can be the first or the last step in a material’s particle size journey and depending on when the technology is utilized, the intended purpose can vary. Moisture-sensitive materials, for example can be great applications for jet milling due to the compressed air nature of the milling environment which can be changed for nitrogen, carbon dioxide, or other inert milling environments (more information on motive gas options later). Other times, applications call for nanometer materials, which require wet milling in order to get the material down to 200-300 microns. These are typical in abrasives, pigment, and pharmaceutical markets and 3D printing in some cases. These materials are often spray dried or atomized after going through a wet milling process. Although this creates a fine, dry powder, the material can agglomerate. Small “satellites” can form around a larger particle, creating flowability issues or quality distortions in extrusion and additive manufacturing production. Many applications require jet milling of hygroscopic materials, but in many cases the operators are not aware of the effect that micronization will have on the material, especially as it pertains to agglomeration. Jet mills are particle size reduction equipment that use high-pressure compressed air to grind materials to single digit microns. Size reduction is the result of high-velocity collisions between the particles of the process material itself. The interior of the chamber is designed to allow re-circulation of the oversized particles, enhancing the incidence and the effect of these collisions. As particles are reduced in size and progressively lose mass, they naturally migrate toward the central discharge port, making precise classification both automatic and precisely controllable. By creating a one-step process in milling and classifying, jet mills have continued to increase their presence in new and exciting markets. 3. No temperature rise in the mill due to expanding air creating a cooling effect, especially important for temperature sensitive materials, such as cosmetics. Jet mills can be powered using many different compressed gases all starting at around 100 psig. Commercially compressed air is by far the most commonly used gas but super-heated steam (no moisture is present in the super-heat state) is used in large installations grinding primarily titanium dioxide pigment. Nitrogen is commonly used when a material must be ground in an inert atmosphere to protect from oxidation and possible fire or even explosion of the product. Argon has also been used for this purpose if the less expensive nitrogen was unsuitable. Light gases such as helium have been experimented with because of the possibility of even higher velocity impacts. Typically, a well-designed jet mill will grind friable or crystalline materials down to the 1 to 10 micron average particle size range. Some products, such as some molybdenum compounds, paint pigments and similar products, can be reduced to particles as small as 200 nanometers. Work in the nano size range can also be the deagglomeration of nano size particles. Particles larger than 10 microns are generally hard-to-fracture polymers such as toner compounds or hard waxes, and some organic materials, but if a larger size is wanted, many products can be ground larger than 10 microns by reducing power to the mill or by increasing the rate of feed. Some products are simply polished to remove sharp edges by running at elevated feed rates with low grinding pressure, a process that changes how the material compacts. Many different methods of milling will claim to achieve less than 10 microns average particle size, but the particle size distribution is what sets the jet mill apart from its competitors. Following are two images, one of a ball milled material (Fig. 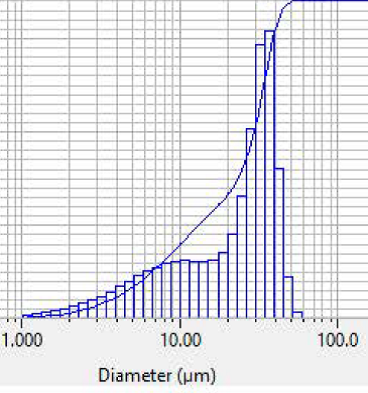 1) and the other of a jet milled material (Fig. 2). 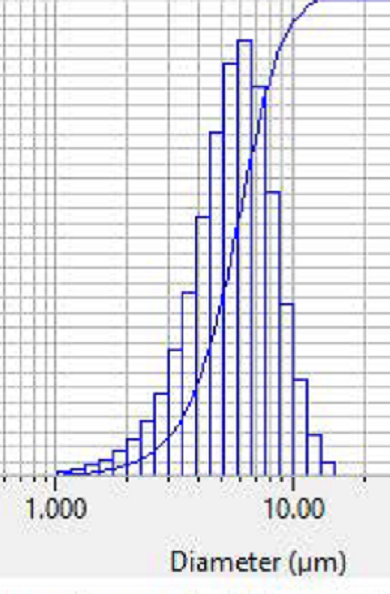 One notices that the main curve moves to the left (decreases in size) but also that the distribution narrows. This is particularly important for high-value material, where process yield is important. Moisture-sensitive materials obviously require dry air during the jet milling process, which is easily accomplished with the use of an in-line dryer system. Should that not be enough, another gas can be used to decrease moisture further in the mill. Some applications have some other challenges that are not so easily solved. Jet milling’s ability to process more than one material at a time proved to unlock a few moisture-sensitive materials’ challenges. In some cases, adding flow agents is the only way to increase shelf life of particularly hygroscopic materials that can agglomerate and cake over time, especially once packaged. By utilizing two feeders for one mill, one could co-feed a flow agent with the virgin material at a specified percentage during the jet milling process, thus producing an evenly blended homogeneous material that eliminated the agglomeration problem with minimal additional cost. The one-step milling and blending allows for minimal material handling, decreasing potential for contamination and quality issues. 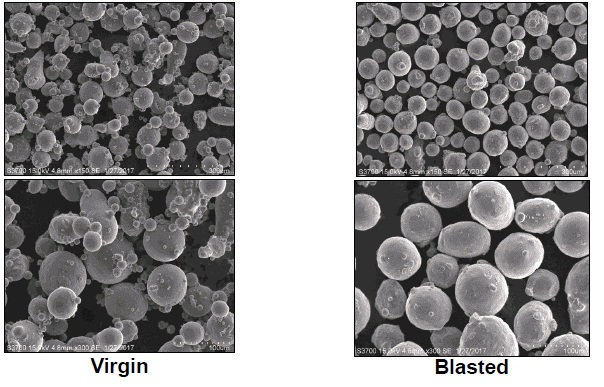 Further, agglomeration continues to be a large issue in nanometer-sized particles that have been spray dried or atomized, where the target particle size has been met but the material has clustered, which negatively impacts the manufacturers’ applications. Jet mills have proven to help in this regard, the particle on particle collisions taking place inside its chamber allows for a de-agglomeration and smoothing of particles which help flow issues and texture. Frederic Surville is VP sales & marketing, The Jet Pulverizer Co. (Moorestown, NJ). The company provides customers with equipment and particle size reduction services, specializing in the chemicals, abrasives, cosmetics, 3D printing, and pharmaceutical markets. For more information, call 312-502-5818 or visit www.jetpulverizer.com.